The Ion Tiger UAV offers high endurance with low noise and heat signatures. Image courtesy of US Naval Research Laboratory. The Ion Tiger UAV powered by liquid hydrogen has recorded an endurance of 48 hours. Image courtesy of US Naval Research Laboratory. The flight crew of the Naval Research Laboratory (NRL) carries an Ion Tiger UAV. Image courtesy of US Naval Research Laboratory. Ion Tiger is a liquid hydrogen-powered fuel cell UAV (Unmanned Air Vehicle). The Ion Tiger UAV is designed for stealthy operations and long endurance operations. It acts as an alternative for conventionally-powered UAVs generating more noise, heat and pollution, making them detectable. Ion Tiger is also an alternative for UAVs employing electrical batteries with low noise and heat, but with low endurance. The UAV offers long endurance as conventional fuel-powered systems, but at the same time has low noise and low heat signature. "Ion Tiger is also an alternative for UAVs employing electrical batteries with low noise and heat, but with low endurance." Ion Tiger is being developed by Naval Research Laboratory (NRL), which is the corporate laboratory of the Office of Naval Research (ONR). The programme is sponsored by Office of Naval Research to enable naval forces to collect vital information in an economic, safer and quieter way. 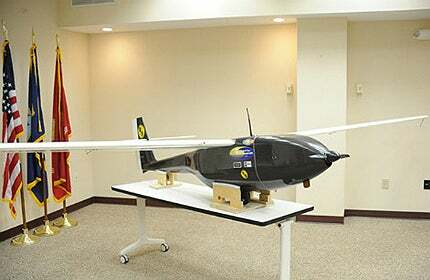 Protonex Technology developed the fuel cell system, the University of Hawaii has supported for system testing and modelling and Arcturus UAV supplied the airframe of the UAV. Tactical Electronic Warfare and Chemistry Divisions formulated the flight capacity of liquid hydrogen. Ion Tiger took its test flight and recorded an endurance time of 23 hours and 17 minutes in October 2009. The UAV recorded an endurance of 26 hours and one minute when fuelled by hydrogen gas stored at 5,000psi, in November 2009. The UAV was powered by a 2.2lb fuel cell with a rated power of 550W during testing. Ion Tiger recorded an endurance of 48 hours during a flight test conducted in April 2013. The test UAV was powered by cryogenic liquid hydrogen instead of hydrogen gas stored in high pressure tank. The liquid hydrogen enhanced the endurance as it is three times denser than hydrogen gas. Ion Tiger is designed to be light in weight to increase endurance. "Ion Tiger is being developed by Naval Research Laboratory (NRL), which is the corporate laboratory of the Office of Naval Research." The components, such as fuel tank and airframe, are built using lightweight composites. Ion Tiger has high wing in wing configuration with wings located above the fuselage. The aircraft empennage is of cruciform design, with the horizontal stabiliser placed mid way up across the vertical stabiliser. The UAV includes a double bladed propeller placed in front of the fuselage. The main challenge in designing the aircraft was to develop storage for carrying liquid hydrogen. NRL also developed the cryogenic hydrogen fuel storage tank for the UAV. The lightweight tank carries fuel in cryogenic conditions. The UAV can carry a payload of 5lb. It can accommodate electro optic (EO) / infrared (IR) sensors for surveillance during day and night. The vehicle can also carry communication relay payloads. The electric fuel cell propulsion system is powered by a unique PEM (Proton Exchange Membrane) fuel cell supplied by Protonex. The fuel cell uses Hydrogen and oxygen to produce electricity through electro-chemical reaction. The heart of fuel cell is the fuel cell stack made up of stackingbipolar plates. The fuel cell also features other supporting components and electronics to support operation. The Bell Eagle Eye is a tiltrotor unmanned aerial vehicle (UAV) developed by Bell Helicopter, a unit of Textron. Skeldar V-200 Maritime is a medium-range vertical take-off and landing (VTOL) unmanned aerial vehicle (UAV) developed by the Saab Group.